When you see the benefits of doing it with your full attention, you will start volunteering to scrub those grimy pots and pans. The word chore makes routine house-work unpleasant before you’ve even started (I like to give chores fun names to spice them up a bit—like mopping ’n’ bopping or home sparkling!). But the great thing about everyday household tasks is that they’re slow, repetitive, and physical, which makes them ideal for settling into mindfulness. In fact, a study at Florida State University found people who washed dishes while attending to awareness of their mind and body experienced a 27% reduction in nervousness and a 25% increase in feelings of inspiration (and those who washed the dishes like they normally would saw no such benefits). Who knew! Feel like giving it a try? Have a go at this mindful dishwashing practice. 1. Be aware of the situation. Take a moment to look at the dishes. How dirty are they? Notice the stains. See how the dishes are laced with residue from your latest snack or meal. What colors and shapes do you see? Now move into your body. How does your physical body feel at the moment? 2. 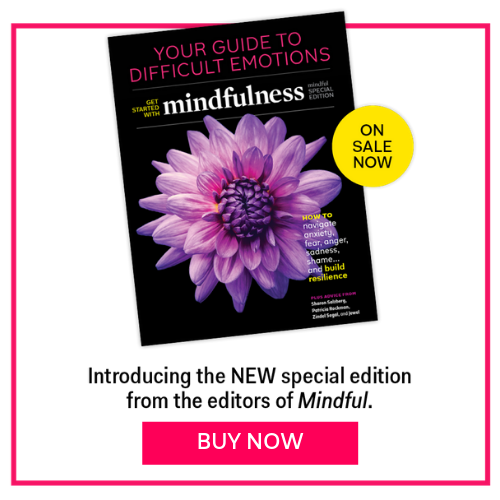 Become aware of any emotions you feel—annoyed or irritated or upbeat? Consider what sort of thoughts are running through your mind, perhaps, “When I finish this, then I can relax,” or, “This is stupid,” or whatever. 3. Begin cleaning, slowly at first. Feel the warmth of the water. Notice the bubbles forming and the rainbow reflections in the light. Put slightly less e ort into the scrubbing than you might normally, and let the washing-up liquid do the work of cleaning. When the dish looks completely clean, wash the bubbles o and see how clean it really is. Allow yourself to see how you’ve transformed a grimy, mucky dish into a spotless, sparkling one. (Go ahead, admire your work.) Now let it go. Place the dish on the side to dry. Be childlike in your sense of wonder as you wash.
4. Try to wash each dish as if for the first time. Keep letting go of the idea of finishing the job or the other things you could be doing. 5. When you’ve finished, ah, look at what you’ve done. Look at the dishes and how they’ve been transformed. And it’s just possible that you’ll be refreshed too, rather than feeling drained by just another #@&! chore!